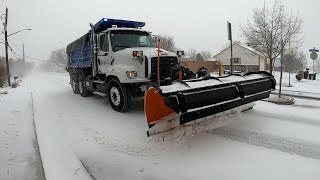 The City of Arvada's Snow and Ice control policy is to plow and apply de-icing material to arterial and collector streets on a priority basis. Priority 1 (Red Routes) streets are arterial streets, essential streets for emergency vehicle response, streets that provide connectivity with plowed streets in adjoining jurisdictions and school zone streets. Priority 2 (Blue Routes) streets are major and minor collector streets which provide access from Priority 1 streets to residential streets. The Priority 1 and 2 streets are shown on the City snow plowing route map. Residential streets are not routinely plowed unless they have steep hills with chronic icing problems. However, they will be plowed if the City Manager declares a snow emergency. Calling the Street Division at 720-898-7725. Please leave a brief message stating your request and the location - by address or reference to cross streets.Your request will be logged into our work order system. Please note that we do not remove packed snow and ice from residential streets that are passable by passenger cars.